A sprain is an injury to a ligament. Ligaments are the connective tissues that connect bones to bones across a joint. These types of injuries are common in sports and falls. 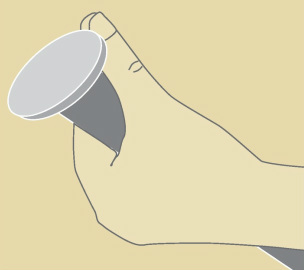 Often, the thumb is jammed into another player, the ground, or the ball. The thumb may be bent in an extreme position, causing a sprain. The thumb will usually swell and may show bruising. It is usually very painful to move. The most common cause of thumb sprain is the ulnar collateral ligament injury (see Figure 1). Injury to this ligament is sometimes called skier’s thumb or gamekeeper's thumb. It occurs when the skier falls and the pole acts as a fulcrum in the hand to bend the thumb in an extreme position (see Figure 2). This ligament may also be injured by jamming the thumb on the ground when falling or by jamming the thumb on a ball or other player. Historically, this condition was commonly observed among gamekeepers and Scottish fowl hunters The radial collateral ligament (see Figure 1) may also be injured. It is much less commonly injured than the ulnar collateral ligament. Figure 1. 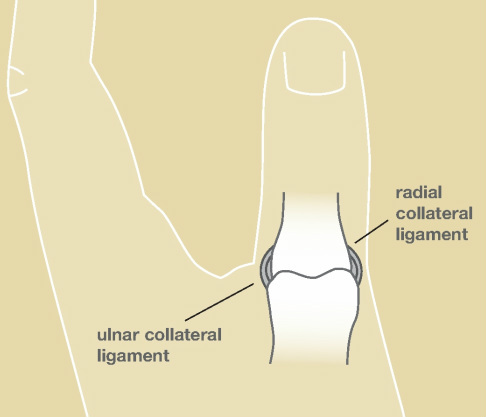 The ulnar collateral ligament (UCL) and the radial collateral ligament (RCL) help stabilize the thumb. Figure 2. Upon falling, the ski pole may bend the thumb in an extreme position and tear the ulnar collateral ligament (UCL), the so-called "skier's thumb" injury. On occasion, fractures may occur along with the thumb sprain. These may require additional surgery with repair using metal pins, screws, or plates. Cartilage damage may occur as well which does not show up on x-ray. This occasionally results in long-term pain and eventual arthritis. Some patients may benefit from cortisone injections or eventual surgery.